After releasing a leaked email which suggests that Anil Ambani visited the office of the then French defence minister in Paris in March 2015, Gandhi accused Modi of "acting as Ambani's middleman". New Delhi: Congress president Rahul Gandhi today alleged that Prime Minister Narendra Modi is “acting as Anil Ambani’s middleman” in the controversial Rafale aircraft deal. He cited a leaked email which shows that Ambani had visited Paris to meet the French defence minister only ten days before Modi announced the Rs 60,000 crore fighter jet deal with France-based manufacturer Dassault. While India has bought 36 Rafale aircraft, Anil Ambani is alleged to have been positioned for a share of the Rs 30,000 crore worth of offset contracts in the new intergovernmental agreement (IGA) India signed with France. The offset responsibility in the previous agreement negotiated by the UPA government was supposed to go to the Indian public sector company, Hindustan Aeronautics Limited, with a clause that Dassault would also transfer its technology to the Indian manufacturer. Also read: Why Were So Many Concessions Granted During the Rafale Negotiations? 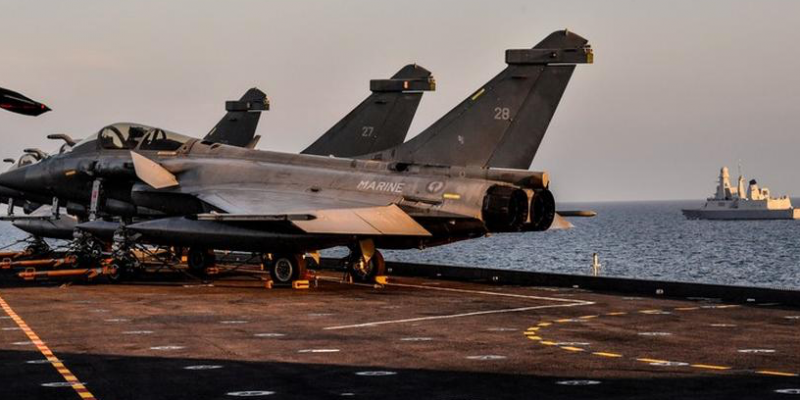 The Modi government and the opposition, which has made the Rafale controversy as one of its main political plank, have been fighting incessantly over the issue. Gandhi’s “middleman” jibe comes close on the heels of the prime minister’s recent speech in parliament. Modi, while trying to defend the Raale IGA, had claimed that never in the last 70 years of independent India had the Congress struck a defence deal without involving middlemen. BJP leaders have also targeted the Congress for allegedly encouraging “dalali” (or commission) in all defence deals. As multiple procedural violations in the deal have been surfacing almost on a daily basis – especially The Hindu’s recent news breaks – the BJP and the Union ministers have struggled to mount a solid defence but have constantly been trying to divert attention towards the Congress’s controversial history in defence deals. They have pointed out the infamous Bofors scam and AgustaWestland VVIP helicopter purchase controversy as cases in point. It was, however, the Congress president’s turn today to hit back at the BJP by using the prime minister’s own analogy. “Now, a couple of questions arise. No. 1 – How is Mr. Anil Ambani meeting the French defence minister, just prior to the prime minister’s meeting?” he asked. He next asked how both the foreign secretary of India and the then defence minister Manohar Parrikar – both of whom had come on record to say that they did not know about the IGA – were not kept in the loop at a time when both Ambani and the prime minister were separately meeting or negotiating with French representatives. The email in question records the exchange between officials at European defence company Airbus. The conversation references a meeting of Ambani and officials attached to the French defence minister Jean-Yves Les Drian’s office where Ambani is said to have noted that “a MOU (is) in preparation” which may be signed “during the prime minister’s visit”. This is hardly the first time that the Congress president has hit out at the prime minister. He coined the slogan, “Chowkidaar chor hai” for Modi’s alleged secretive or parallel role in the aircraft agreement. He has also alleged that the prime minister was personally involved in the corruption that appears to have taken place in the contract, and has also called Modi a “traitor”. Gandhi also dismissed the Comptroller and Auditor General’s report on the defence contract that is supposed to come out soon. “CAG is Chowkidaar Auditor General report, written by Chowkidaar, audited by Chowkidaar,” said Gandhi, who has been alleging that the Modi dispensation has seriously compromised autonomy of public institutions. Clearly, Gandhi was attempting to raise questions about the independence of the CAG, Rajiv Mehrishi. Prior to his appointment as the CAG, he served as the finance secretary and then the home secretary in the Modi government. Gandhi’s charge, however, drew a strong rebuttal from law minister Ravi Shankar Prasad. “How Rahul Gandhi got the email of a private company is in a cloud. Regardless of the shameful manner in which Rahul Gandhi is acting as a lobbyist for companies, the country will not bend. The country needs fighter planes and good defence equipment,” said the minister, adding that the Congress, which is habitually corrupt itself, is only making false allegations. Modi, in his recent speech at the parliament, had asked Rahul whether he was lobbying for companies which were not benefited in the Rafale deal.